AP DEECET 2019 Results , Check Manabadi AP DIETCET (TTC) Results, Rank Card @ apdeecet.apcfss.in, Download AP DIETCET Rank Cards, Counselling Dates at Manabadi, schools9, Eenadu, Sakshi. Commissioner of School Education, Government of AP has organized the AP DEECET/ DIETCET Exam on May this year. This examination has been organized in many examination centres across the state. Many of the aspirants have appeared for the AP DEECET Examination this year, the reports suggest. The CSE AP has released the answer keys of DEECET soon after the examination completed. All the Participants have checked with the answer keys and estimated the probable score in the examination. Hopefuls competed for the AP DEECET 2019 and waiting for the results can go through the following article for more updates on AP DEECET result cutoff marks, and merit list information. As per Schedule given by officials, AP DEECET/DIETCET Results was to be release in July 2019 . The government of Andhra Pradesh School Education Department is responsible for conducting various admission tests for aspirants seeking admission in educational degree/diploma courses. Annually various examinations will be conducted such as Language Pandit Entrance for Telugu, Hindi and Urdu, TTC, NTSE, NMMS, D.Ed, C.L.I Sc, Head Masters Accounts Test etc. The CSE AP annually conducts the Diploma in Elementary Education Common Entrance Test (DEECET) examination for aspirants seeking diploma in elementary education course. The AP DEECET is also known as AP DIETCET. Candidates clearing this test with good merit will get admission in 2-year Diploma in Elementary Education course in Private and Government District Institutes of Educational Training in Andhra Pradesh. Yearly, many of the hopefuls compete for this examination to get admission in D.Ei.Ed courses. The AP DEECET was successfully completed on 17th and 19th May in many examination centres of Andhra Pradesh state. 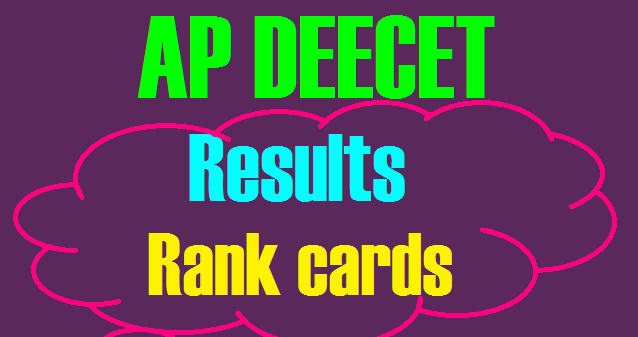 AP DEECET Results 2019 DIETCET Rank cards available on apdeecet.apcfss,in. Candidates can also check their AP DEECET Results 2019 on other websites like eenadu, sakshi, manabadi, indiaresults.com etc. Candidates can Check Results, and Download Rank Card from the direct link given below. All the competitors those have given the test and desperately waiting to check the results can visit the official portal, deecetap.cgg.gov.in to Download AP DEECET Result 2019, Cutoff Marks, Merit List. Candidates can take the below steps to Download AP DEECET result. The CSE AP is expected to results within 3 to 4 weeks after the examination. Hence candidates appeared for the examination can keep visiting the official website, apdeecet.apcfss.in. The CSE AP will decide the cutoff marks based on the level of competition, the difficulty level of question paper and various other issues. Aspirants need to score the minimum cutoff marks/qualifying marks to clear the examination. Candidates clearing the test with required marks will be listed in the AP DEECET Merit list.